Not a problem at all, Ohiodyigirl. I had to upgrade to a new fangle phone for work and it has a decent camera on it. Took me forever to figure out how to get the pictures into my Mac, but now it's easy, quick and fast. Here are the pieces I received from alwaysinmyroom. I love them. My theme is black & white & red (read) all over. love them! and that kitten is so precious!!! Recieved my first piece from AudioAstrophysics today. I love the hidden animals in the stars!! beautiful piece! artzknitz--it was fun incorporating your knitting into the pieces as well...have you read the book on the piece? It is on my Christmas list! 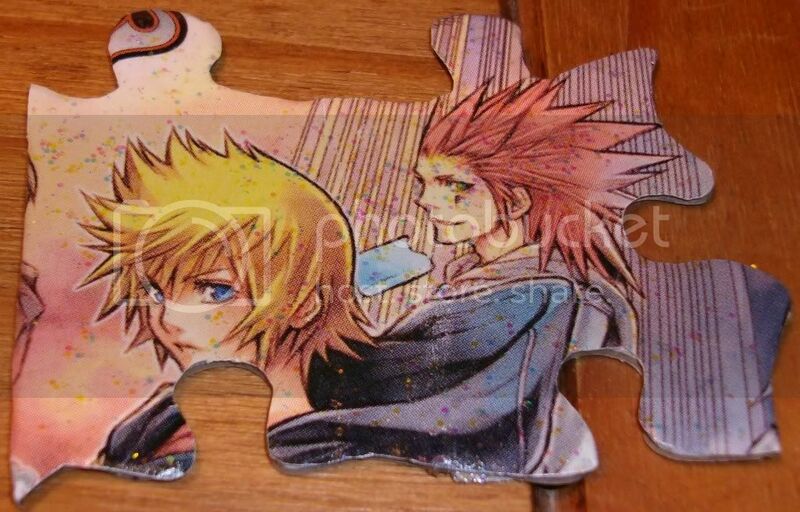 Another beautiful puzzle piece displayed. I continue to be in awe. AudioAstrophysics--you have a beautiful style. I think I recognize your pieces even before I learn who altered them. Alwaysinmyroom--I have not read that book, but you can bet I will be looking for it. I volunteer at the library, and so many books pass through my hands as I shelve them. I have to force myself to put them away. So far I have purposely stayed away from the knitting shelf. Another one recommended by a friend is The Beach Street Knitting Society and Yarn Club. She said it's delightful. So many books. . . so much yarn. . . so many puzzle pieces. . . I hope my avatar shows up on this post. It has been giving hubby and me much trouble. I agree--too many books to read and fun things to do--but we are lucky to have the luxury of recreational time in this country...I am thankful for that!! Wow, it's been a long time since I've replied in the gallery. I love all the pieces! Everyone's puzzles are going to be so gorgeous. smmarrt - I love the texture of your yarn/strunk piece hole punches piece! I never would have thought to use them like that (though I do usually save them, I've got a whole baggie full!). I really want to feel them, they look so neat. MunLtStmpr - Your pirate map is great! I love that it rolls out, awesome. And all the jewels are perfect embellishments. shannin - I can't believe how tiny you painted those flowers! audio - all your pieces are amazing as usual. I love the punchinello (right?) stars, and I'm so jealous of your elephant punch. alwaysinmyroom - sleepy reading kitty, adorable! And I love the glasses. Great interpretation of the theme! PirateColey - I love your quotes and your shoe charm. I wish I could rock heels that high (luckily mr. bunnyface is a shorty, so I have an excuse for wearing flats). from ohiodiygirl, I present Roxas and Axel from Kingdom Hearts (technically this is from Kingdom Hearts 358/2 Days). I love it!!!!!!!!!!!!!!!!!!!!!! the little spots are actually glitter, they just don't show up that way in the picture. but as long as I can see it, that's all that matters.